I hope that you look forward to our fantastic, amazing, and unbeatable Vollox Christmas Party THIS SATURDAY! Food: Maite is away this week, which means that she will not have time to prepare any food. We need too bring it all (which has worked really well in the past). Can you please let me know what you want to bring so that I can coordinate what is missing? If you don’t know what to bring ask me. Drinks: Bring anything that you fancy (alcoholic and non-alcoholic). I will prepare a “Christmas Punch on Fire” (Feuerzangenbowle). Presents: We do Secret Santa! However, this will be slightly different compared to last years. How it works: Have a look around your home and find something that you don’t need and that is of some value to others. Wrap it nicely and bring it along. We need people who can help prepare the house for the party on Saturday. Can you let me know when you are available, please? There is space so people are welcome to sleep over. Men’s 1 & 2 play against each other at Headington Girls School on Sunday at 6pm. Come and watch! Our beloved Ladies 1 team captain, Annika Voss, is feeling particularly brave this Christmas. She has taken on the challenge together with six other people to compete in a 'two man bobsled' against the Royal Airforce, during their 'Novice Week'. The charity event is taking place in Igls, Austria this week. Annika's team is raising money for the RAF Benevolent Fund and Help for Heroes. Please help them raise as much money as possible by donating on their justgiving page. For daily updates, photos and videos, check out their Facebook page. Best of luck to Annika! Mixed Game - Winning Spree !! 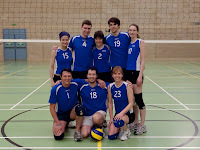 I am glad to announce that the Mixed team won both games yesterday while playing @ Headington. We were happy to have a few supporters, but if you couldn't make it I have summarised the games below. The team playing was Karina (setter), Helen (4), Anna (4), Kerstin (4 & 2), Simon (3), Cornelius (3 & 4), David (3) & myself (2). win" was on court. Both teams got told off for being a bit "too noisy" between points... We had a good start, made the difference during the game and won with a large point difference the first set (25-11), mainly due to nice passing, excellent setting and strong finishes (including a few balls within the 3 meters from our middle players...). Again, the second set started well (12-6) but then Farnborough managed to gather up and caught back with us (14-12) forcing us to take a timeout. It was clearly needed for gathering up, and it worked ! We finished the set with the final score 25-18. Again both teams showed that they had fun playing, and the spirit on court was great. The MVP title went to Karina for her amazing job at setting. 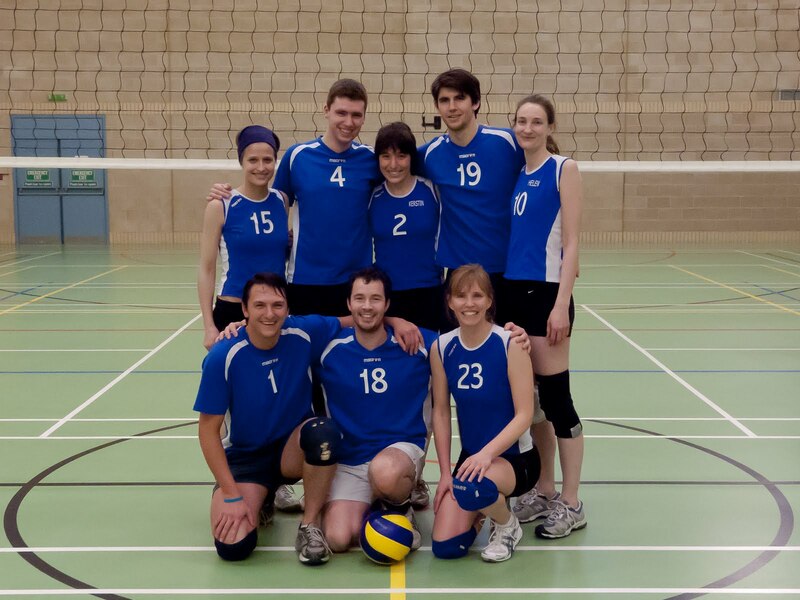 On Sunday 4 December, the Men 1 team were out to win two more matches in division 1 of the bva league. To do this, we had Rune, Jeremy, Steve, Jon, Gabriele, Gerard, Martijn + plus a bunch of fans pledging their allegiance to the 1st team! Team 2 still warm from the previous match took the first points on serve. We then woke up and started playing our game. A good service run from the only Frenchman in OVC Men 1 got us in a 17-11 lead. From there we never looked back and thanks to some good blocking and finishing of points we went on to win the first set 25-15. In the 2nd set, OVC Men 2 were looking for revenge and we got a bit sloppy. The level of our blocking and defence went down and they took advantage of this by taking the lead early on and extending this from 15-11 to 19-13. Then we won a couple of good points and believed that we could still win the set. A 7-point service run from Gabriele, with some good pickups and hits, got us back in the game at 22-22. Then we got some help from the referee and we won 25-23. It was not the best way to win a match, but we still won the match 2-0. I am sure they will be out for revenge on Sunday 18 December when we play again in Headington. MVP for us was Rune! Our second match was against Maidenhead. They had only lost one match so far this season, so we were prepared for a strong opposition. From the start, we took the initiative by serving well and some good blocking against some powerful hitting. We took the lead at 7-2 and never gave it away to win the 1st set 25-17. Due to injury, they played with a ‘ghost’ player for the whole of the second set. This seemed to confuse us more than it did them! They were a couple of points ahead for most of that set until the business end at 19-19. We finished the important points with some good defensive play and then Jon served the last 3 points to win 25-20! MVP: Gabriele!